US NavyUSS Missouri (BB-63), 1986. Large harbour tugs assist the battleship USS Missouri (BB-63) into port for recommissioning. In the background is the San Francisco skyline. The USS Missouri has been described as the most famous battleship ever built. Nicknamed “Mighty Mo,” the Missouri was an Iowa-class battleship that saw combat in World War II, the Korean War and the Gulf War. 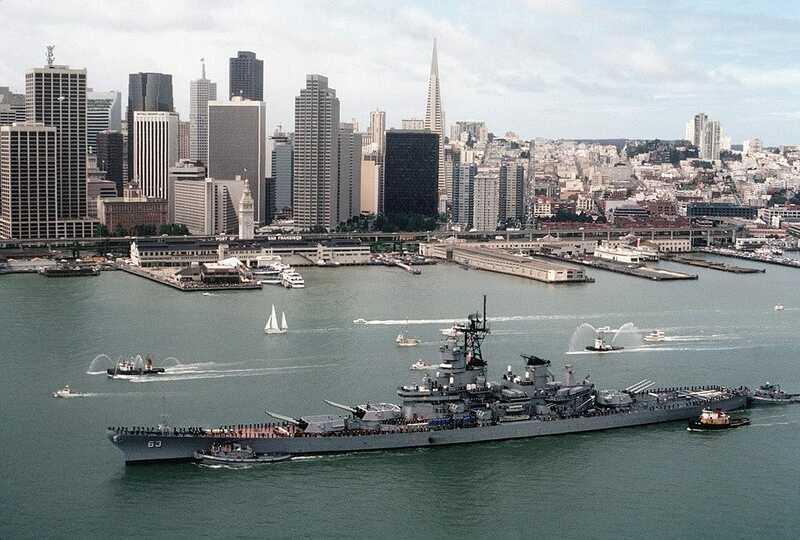 Before finally being decommissioned in 1992, the Mighty Mo received three battle stars for its service in World War II, five for the Korean War, as well as two Combat Action Ribbons and several commendations and medals for the Gulf War. And throughout the Mighty Mo’s long service, the warship was barely scratched. Here’s the story of the Missouri. Laid down in January 1941, the USS Missouri was the last Iowa-class battleship to enter service, and was actually christened by then-Sen. Harry S. Truman’s daughter, Margaret Truman. 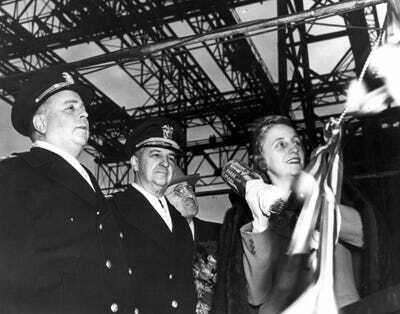 US NavyMargaret Truman christens the USS Missouri with then-Sen. Truman in the background at the New York Navy Yard on Jan. 29, 1944. 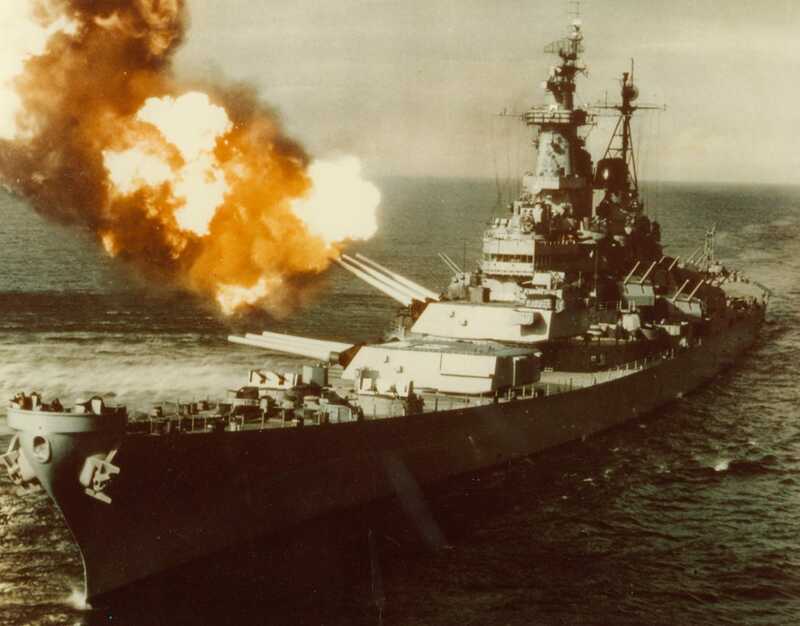 As an Iowa-class battleship, the most powerful class of battleships, the Missouri was armed with nine huge 16-inch guns, 20 five-inch guns, 80 40mm anti-aircraft guns, and 49 20mm anti-aircraft guns. 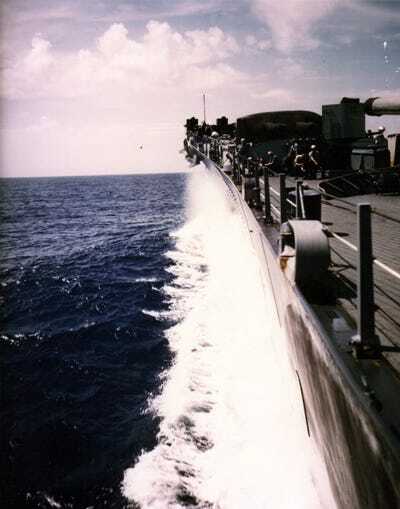 US NavyThe Mighty Mo fires a salvo from the forward 16/50 gun turret during her shakedown period in August 1944. The Mighty Mo’s 16″/50 calibre Mark 7 guns fired 1,900 and 2,700 pound projectiles up to 24 miles away. In fact, the guns were so powerful that they recoiled four feet when fired, with the blast pressure pushing the water out, creating the illusion that the ship was moving sideways. The warship was also incredibly fast, with a top speed of 33 knots, or about 38 mph, about 6 mph faster than the older South Dakota-class battleships. US NavyView along the Mighty Mo’s port side during a high-speed run while on her shakedown cruise in August 1944. During World War II, the Missouri supported the landing at Iwo Jima with her 16″ guns, the bombardment of Okinawa and the island of Hokkaido, and more. US NavyThe Mighty Mo fires its center 16′ guns during a night gunnery exercise in August 1944. 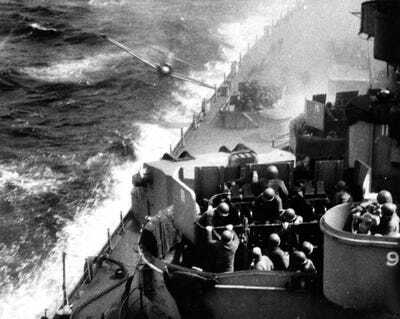 In April 1945, the Missouri took one of its only known hits when a Japanese Kamikaze pilot evaded the Mighty Mo’s anti-aircraft guns and hit the battleship’s side below the main deck. But the impact caused minor damage. US NavyA Japanese A6M Zero Kamikaze about to hit the Mighty Mo off Okinawa on April 11, 1945, as a 40mm quad gun mount’s crew is in action in the lower foreground. 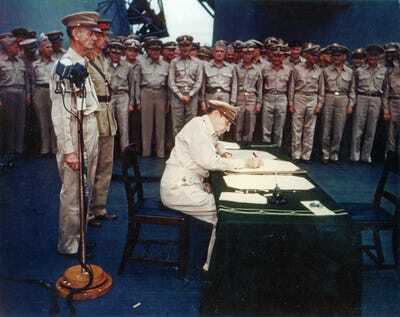 In fact, just a few months later in September 1945, World War II officially came to an end on the deck of the Mighty Mo, where the Instruments of Surrender were signed by the Allies and Japanese in Tokyo Bay. US NavyGeneral of the Army Douglas MacArthur signs the Instrument of Surrender on the USS Missouri on Sept. 2, 1945. The Mighty Mo sailed the Mediterranean in 1946 in a show of force against Soviet incursion. Four years later, in September 1950, the battleship joined missions as part of the Korean War. US NavyThe Mighty Mo fires a salvo of 16-inch shells on Chongjin, North Korea, in an effort to cut enemy communications in October 1950. As the flagship of Vice Adm. A. D. Struble, who commanded the 7th Fleet, the Missouri bombed Wonsan, and the Chonjin and Tanchon areas in October 1950. For the next three years, the Mighty Mo would bombard several other areas too, including Chaho, Wonsan, Hamhung, and Hungnam. The Mighty Mo was later decommissioned, for the first time, in February 1955 at the Puget Sound Naval Shipyard. But in 1986, with the Cold War still raging, the Mighty Mo was brought back to life as part of the Navy’s new strategy that sent naval task groups into Soviet waters in case of a future conflict. US NavyLarge harbour tugs assist the battleship USS Missouri into port for recommissioning with the San Francisco skyline in the background in 1986. The Navy also modernised the Mighty Mo as part of its recommissioning, removing some of its five-inch guns and installing Harpoon and Tomahawk cruise missiles, Stinger short-range surface-to-air missiles, and Phalanx close-in weapons systems. And these new weapons were put to use during the Gulf War, where the Mighty Mo fired at least 28 cruise missiles, as well as several hundred 16″ rounds, on Iraqi targets. 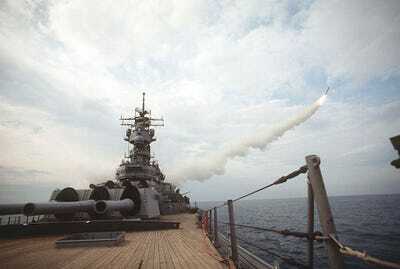 US NavyThe Mighty Mo fires a Tomahawk cruise missile at an Iraqi target in January 1991. 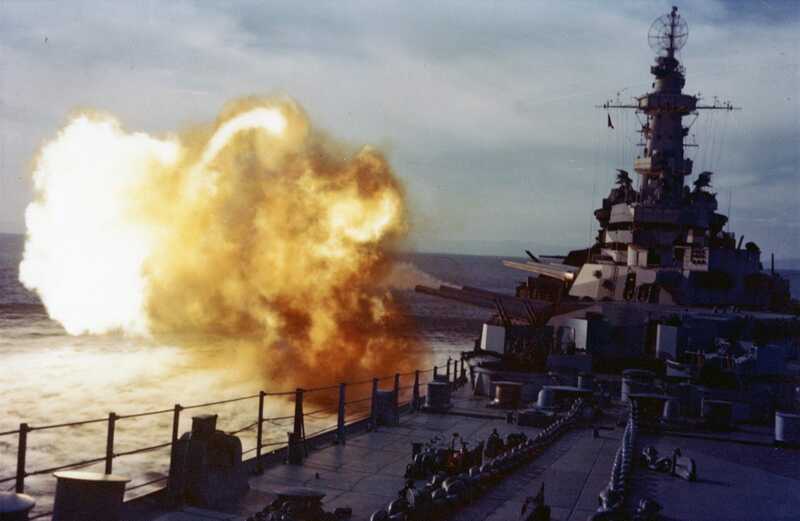 In fact, the Mighty Mo had a fairly close call on Feb. 23 when it was firing 16″ rounds in support of an amphibious landing along the Kuwaiti shore. 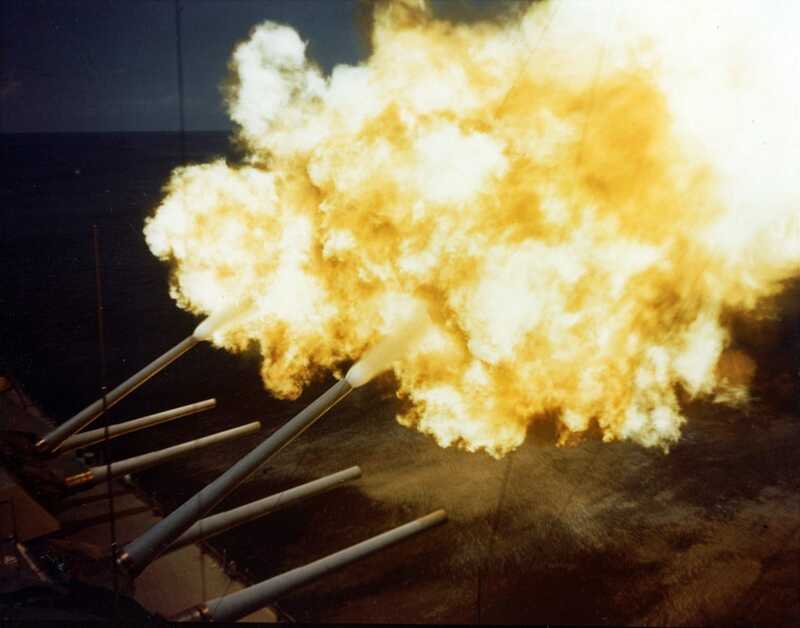 The Missouri’s loud 16″ guns apparently attracted enemy attention, and the Iraqis fired an HY-2 Silkworm missile at the ship. But the British frigate HMS Gloucester came to its rescue, shooting the missile down with GWS-30 Sea Dart missiles. In 1992, the Mighty Mo was decommissioned for the second and last time. The battleship was removed from the Navy’s reserve list in 1995, and moved to Pearl Harbour as a museum and memorial ship in 1998. 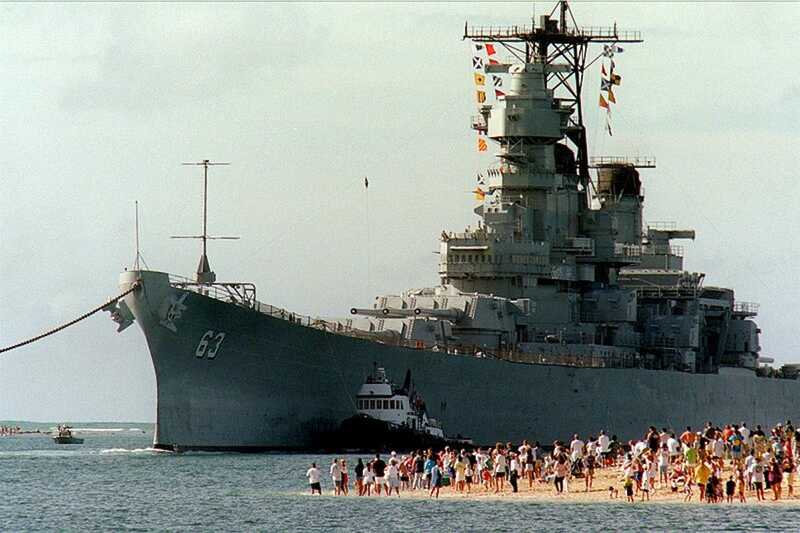 Wikimedia CommonsThe USS Missouri arrives in Pearl Harbour, where it now permanently rests next to the USS Arizona, in June 1998.